Do you know how to extend the life of your hood frame? Click here to find out more. Please read the important information below before you make a decision as to who fits your hood. hood against a non original hood. We will point out the various differences between the two types of hood to enable you to make a more informed choice when comparing. Original rear zip window design eliminates any possibility of water leakage through zip. The hood on the left is a High Grade 'Hot Hood' made to the same design as the original Mazda hood. The hoods on the right is made to a non-original design. Look more closely and you will see that the non-original hood has a stitch line around the zip window. This is prominent and goes up the sides of the window and across the top. The original hood has no visible stitching on the outside of the hood. Stitches that are exposed to the elements can quickly fade, become brittle and fail. There are also the obvious problems with water ingress through the stitch holes. Another major difference is the construction of the rear section of the hood. The non-original hood in the photograph has a single skin rear screen design. 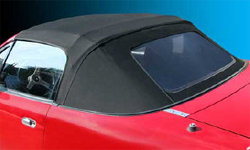 Compare this to the original Mazda and High Grade 'Hot Hood' which have a double skin rear screen window design incorporating a replaceable inner zip window section which extends across the whole rear section of the hood and an outer section (or rear window curtain as it is called) which effectively provides a double skin layer to the side quarters of the hood. This original design is more complex. The extra layers of material greatly add to the insulation properties of the hood and the zip window positioning provides the best possible protection from draughts and water leaks. See the difference between these two photos. Some hoods are being advertised with an extended roof area to cover door seals? I find this claim to be a little misleading. Any new hood that does not adequately cover above the door seals would be considered a poor fit and if you extend it beyond the door seals it will interfere with the door opening. You therefore cannot extend the roof beyond its optimum size but you can ensure it stays that size by using high quality hooding materials and construction methods to re-enforce stressed areas. Mazda and our High Grade 'Hot Hood' incorporate such features to resist premature shrinkage and this can be explained in the photos below. The sides of the original Mazda & High Grade 'Hot Hood' are double skinned. (See left photo). This is achieved by gluing a second layer of material around the inside of the hood. This second layer re-enforces the sides of the hood and also carries the side tensioning cable. The side tensioning cable is passed through the material and held tightly sandwiched within the sides of the hood fabric. This arrangement not only provides a superior tight seal against the hood frame but the double layer also provides superior resistance to shrinkage. Some after market hoods that we have seen omit to glue the re-enforcement material to the inside of the hood. (See right photo). The material is simply sewn on as a loose flap through which the tension cables will pass. This loose flap of material is not providing the same function as the original glued re-enforcements on the original Mazda and High Grade 'Hot Hood'. The hoods sides remain a single thickness providing considerable less resistance to shrinkage and damage. In addition the side cable passes through the loose flap of material and therefore does not hold the sides of the hood as well as it was intended too. This non original design cuts costs from the manufacturing process at the expense of losing the obvious benefits found in the original design.sts. We hope that the above information will enable you to make a more informed choice when choosing who fits your hood.